Burial Fisherville Cemetery, William's Twp, MI, USA, next to his mother Mary. William Woolsey Skelton married Maria Ann Houghton, daughter of Daniel Houghton and Lydia Cutler, in 1853 h/2. 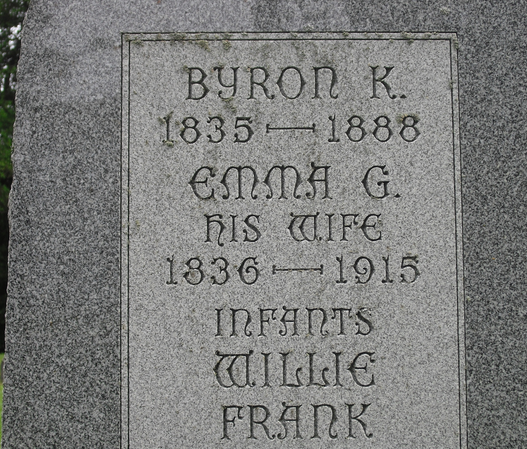 William Woolsey Skelton and Maria Ann Houghton were divorced. Mary E. Tillapaugh married James F. Houghton, son of Daniel Houghton and Lydia Cutler, in Jan 1, 1860. Julia Cross married James F. Houghton, son of Daniel Houghton and Lydia Cutler, in Nov 4, 1891 at Bath, Clinton Co., MI, USA, age 53 and 48; mar "40" years for both in 1900 census; mar "50" y in 1910 census. 1870 Census 1870 Woodhull, Shiawassee Co., MI, USA, age 29, a farmer, property $4500-870; and Lydia Luther, age 20, "at home"
1920 Census 1920 Sciota, Shiawassee Co., MI, USA, age 76, next door to son James D.
Burial Laingsburg Cemetery, Laingsburg, MI, USA, in same block as son James D.
Amanda H. Smith married David Houghton, son of Daniel Houghton and Lydia Cutler, in Jul 7, 1864. Frankie Tillapaugh married Daniel Houghton, son of Daniel Houghton and Lydia Cutler, in Mar 21, 1869 at Brighton Twp, New Hudson, Oakland Co., MI, USA, he age 23, of Milford, a farmer; she age 20; JWH: Mar. 18 1869. Emily Nimblet married H. Linall. H. Linall married Emily Nimblet, daughter of Seth Nimblet and Julina Houghton. Volney A. Houghton married Celia Ann Potter in Feb 5, 1829 JWH: 2,25,1869. Part 1: Groom Names A - I Compiled by Karen E. Dau. Sally A. Houghton married Morgan E. Case. Celia Ann Potter married Volney A. Houghton, son of Samuel Houghton and Jemima Marshall, in Feb 5, 1829 JWH: 2,25,1869. Morgan E. Case married Sally A. Houghton, daughter of Samuel Houghton and Jemima Marshall. 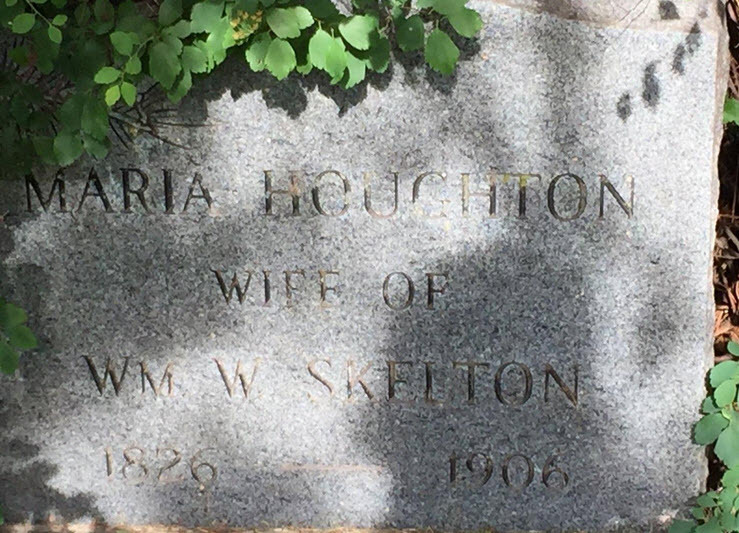 Sophia Houghton married Albert G. Harris in Aug 23, 1838 at Fairfield, NY, USA, JWH: Sep 21, 1838. Clark Houghton married Eliza Ann Arnold in Sep 15, 1856. Lovell R. Houghton married Louisa E. White in Jun 4, 1849 at Fairfield, Herkimer Co., NY, USA. Volney A. Houghton married Sarah A. Parkhurst in Feb 25, 1850. Diantha Houghton married George T. Morris in Jan 6, 1848 MLM: Jan. 6, '40. 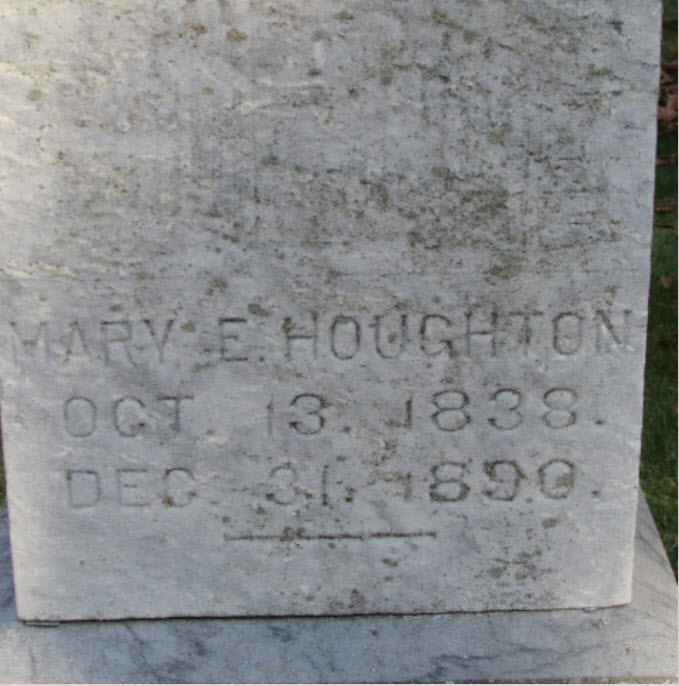 Mary Ann Houghton married A. Jackson Cole in Apr 7, 1856. Louisa Maria Houghton married Milton Ford in Feb 24, 1858. Annette Houghton married Frank S. Ford in Jan 16, 1852. Albert G. Harris married Sophia Houghton, daughter of John Houghton and Persis Pauline Cobb, in Aug 23, 1838 at Fairfield, NY, USA, JWH: Sep 21, 1838. Eliza Ann Arnold married Clark Houghton, son of John Houghton and Persis Pauline Cobb, in Sep 15, 1856.